Stanford University ant expert and Biology Professor Deborah Gordon has co-developed a model of ant behavior that could help keep spam off email servers. The research done by Gordon and Fernando Esponda, a professor of computer science at the Instituto Tecnologico Autonomo de Mexico, suggests that ant colony defense behavior relies on the "diverse reactions of many," to stand up a simple security protocol worth emulating. According to "Distributed Nestmate Recognition in Ants," published this week in biology journal The Royal Society Proceedings B, each ant has a boundary between the scent of friends and foes, which is a result of its experience of encounters with other ants. As it goes beyond its nestmates and encounters other ants that may act in an unfriendly way, it records the chemical profiles of those "non-nestmates" — to a point. A given ant can only retain information about a limited number of non-nestmates. 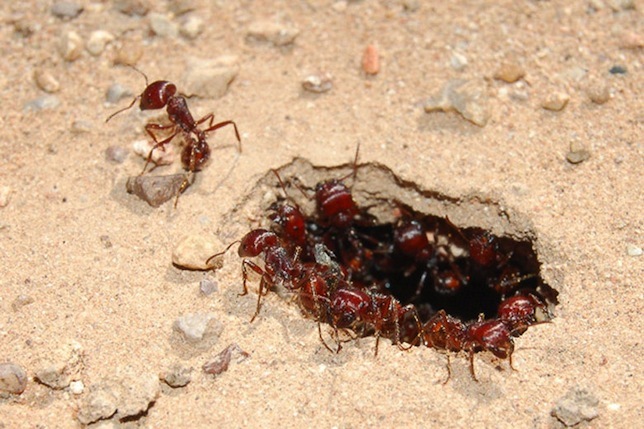 So the safety of the colony relies on the ants' overlapping collective knowledge, according to the researchers. "No one ant knows every foreigner, but because each ant knows a few foreigners, the whole colony knows how to keep foreigners out most of time," Gordon said in a statement. As the paper explains, this "distributed system" lets a colony identify non-nestmates "without requiring that all individuals have the same complete information." The system also accommodates changes in non-nestmates over time, "because only a subset of ants must respond" to provide an adequate defense response. How does this relate to blocking spam? Email services typically maintain a list of good and bad email senders. Like an ant colony recognizing after a non-nestmate, the spam software blocks the email from bad senders, a list that constantly needs updating. The ant research suggests that breaking up that "master list" and coming up with a way to share the detection of new threats could turn out to make a stronger spam filter. "It's an arms race," Gordon said. "But a distributed decision network, similar to how ants...operate, might be a better defense against hackers, because they can't simply penetrate the central system's code." This isn't the first time Gordon has applied her ant findings to the world of computer operations. In 2012, she and Stanford colleague Balaji Prabhakar, a professor of computer science and electrical engineering, showed that the algorithm ants use to decide when to forage for food mirrors the protocols that control Internet traffic — nicknamed the "anternet."